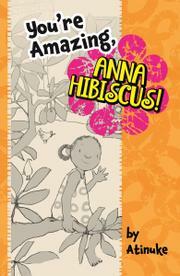 The importance of family during difficult times permeates the final book in the Anna Hibiscus series. In the gentle, frank tone readers have come to expect, gifted storyteller Atinuke balances compassion and humor while tackling a sensitive subject, the death of Anna’s beloved grandfather. The first chapter sets the scene. Anna is back at home in the mixed-race family’s city compound with Anna’s twin little brothers, Double and Trouble, getting in all sorts of mischief—deleting pictures on Uncle Tunde’s cellphone but saving the day by climbing in a window when the doors are accidentally locked. Meanwhile, Grandfather is growing more and more tired. Family members take turns sitting with him, but Anna refuses, hoping that if she doesn’t think about “the really bad thing” it will not happen. “Then one day Grandfather did not wake up anymore.” Anna is grief-stricken. In the final two chapters Anna, tenderly supported by her loving extended family, all also grieving, each in their own way, learns to listen for Grandfather’s voice in her heart. The book ends with near-perfect modeling of shared grief and healing, as everyone tells their favorite grandfather story. Readers’ understanding of Anna’s genuine grief is amplified by Tobia’s grayscale sketches.